I knew you’d be back for more! After looking through the Main Menu in Parts 1 - 6 and going over the Project Header in Parts 7 - 9, it only makes sense to keep following along the top of our Editor by taking a closer look at the Account Library and User Profile. So, let’s continue. The User Account Library is located to the right of the Project Header. 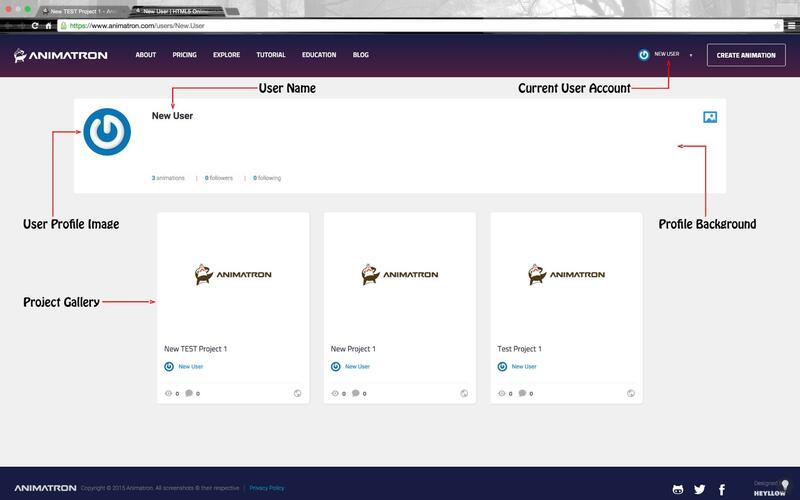 Click on the Library Grid Icon to locate and organize all of the projects that you have created using the Animatron Editor. Any projects that you have been granted access to, and recently worked on editing will show up in this library as well. By clicking on the Library Grid Icon, your Account Library will be brought up in a new browser tab, as shown below. Access your User Profile Options to the right of the Feedback Button, which gives you alternative account options in a drop-down window. Clicking on the Profile Thumbnail, shown above, will prompt a drop-down menu for additional account options. Also, you can Explore other user's public projects through the Animatron Gallery. Access Animatron’s resource of written guides and video tutorials by clicking on Tutorials. 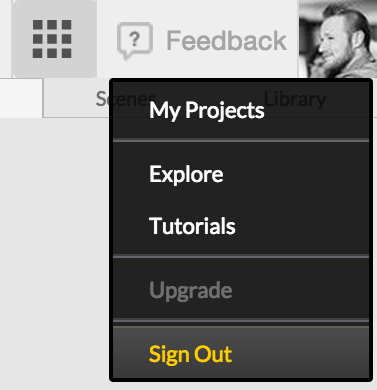 Lastly, click Sign Out, at the bottom of the drop-down menu, to logout of your current user account. Now that you are familiar with all of your special account and project options, let us move on to the fun stuff and discover the Canvas and Toolbar, in parts 11 - 17!